It's been almost twenty years since Shaft last took charge of the big screen, and a lot has changed over the past two decades. Now, Samuel L. Jackson is back, and this time he'll have to go against a world that is not ready for his sass. This time, Shaft will be joined by not only his legendary badass uncle, but also his more refined, less aggressive son. It will be one reunion the streets won't see coming. 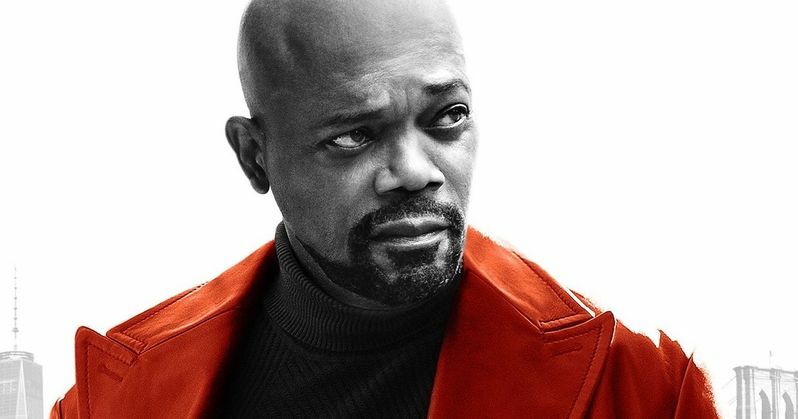 Today, we have the first trailer for Shaft. The franchise is rebooting itself with a new lead character in Jessie T. Usher, who plays the son of John Shaft the Second. But we're not so sure he's taking over this crime series, as his dad, played by the legendary Samuel L. Jackson, has seemed to push him out of the spotlight, taking center stage. And original Shaft star Richard Roundtree is also in the way, nudging Jessie T. Usher to the back of the line. But original Shaft fans wouldn't have it any other way. Younger audiences perhaps aren't familiar with Shaft. The film series launched in 1971 as a blaxploitation action-crime film, which scored two back-to-back sequels in 1972 and 1973, with Shaft's Big Score and Shaft in Africa. And in 1973, Shaft headed to the small screen for a short lived TV series. During that time, Richard Roundtree was the only actor to ever play Shaft. And that remains true to this day. The 2000 'reboot' was actually a secret sequel. Roundtree wasn't used in any of the promotional material, and the fact that Shaft was John Shaft II's uncle came as a surprise midway through that action adventure drama. The 2000 era Shaft was a number one hit, and it's unclear why it never got a proper sequel. That storyline dealt with a racist son of a wealthy real estate tycoon, who is guilty of murder. Christian Bale played the perfect villain, channeling his own Patrick Bateman, before he'd become known as one of the best big screen Batmen. This new Shaft will deal with three different generations trying to navigate the modern world with varying degrees of success. And it should be a lot of fun, as Samuel L. Jackson's Shaft doesn't have a lot of tolerance for the wet boys of the day. Yesterday, we got the first official Shaft poster, which promises that none of us are ready for this. And after watching the trailer, I can say, I'm ready. Jessie T. Usher (Independence Day: Resurgence) is the estranged son of John Shaft II, a cybersecurity expert who's forced to team up with his estranged father and great uncle. The ensemble cast also features Alexandra Shipp from the X-Men movies. Tim Story (Ride Along) directs this action packed cop drama. Jackson had this to say about the movie, and Usher's new character. "He joins the FBI, which is sort of anti-Shaft family values. So when he comes to me for help, it's a matter of reshaping him. [My Shaft] has mellowed a bit. He's not quite as crazy and cynical. Maybe a bit more devil-may-care the last time we saw him. But still an extremely dangerous and funny character." Shaft, which was originally titled Son of Shaft, is being positioned as one of this summer's big tentpole releases. Which, perhaps, isn't truly its nature as a scrappy, cold winter outing that probably would have scored big in the back half of 2019. We'll get to see the cinematic saga continue on June 14. That's one bad mother...Shut yo mouth! This trailer comes direct from Paramount Pictures.